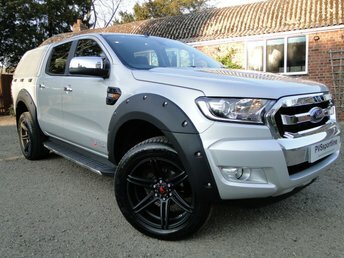 Welcome to Our Fabulous Special Edition PVSsportline Ford Ranger XLT, Upgraded To Our Own Specification Including, 20" Tomahawk Navajo Matt Black Alloy Wheels + XL Rated Tyres For Commercial Use, Raptor Extended Arch Kit, Black Rear Lamp Protectors, Presented In Moondust Silver, And Benefiting From All The Usual Ranger Equipment, 1 Owner, 2 Keys, Full Service History, Truckman Canopy, Rear Load Liner, DAB Radio, Air Conditioning, You Really Need To See It To Appreciate It!! We Are Happy To Provide A Phone Tour Of Any Vehicle To Accompany The Extensive PHOTO And VIDEO Presentation. Please Go To Our Web Site To View The Video. Please Visit Our Website For Further Details. Known across the world for its range of commercial vehicles, Ford's line-up of vans includes models to suit every business. The Ford Fiesta Van combines the efficiency of a small car with the practicality of a commercial vehicle, while the legendary Transit has set the benchmark for efficiency and loadspace for decades. You'll find a wide selection of used Ford vans for sale in Huntingdon here at Prime Vehicle Sales. We stock models to suit a huge cross-section of drivers, so whether you're in the market for a compact commercial vehicle that's suitable for small deliveries, or a large panel van that'll allow your company to grow, our team is here to help. Get in touch with the Prime Vehicle Sales showroom now to discuss your requirements after viewing our current stock of used Ford vans here on the website.